After digging out the Tang mouths a few days back, I thought I'd go ahead and knock out the Hardee's California Raisins as well. This promotion was a little more in line with the overall goals of Hardee's. 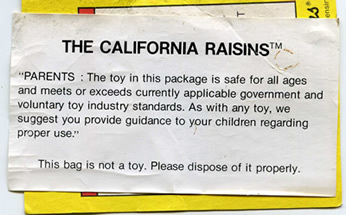 While the Tang mouths were completely questionable in purpose, the California Raisins promotion helped shove countless cinnamon raisin biscuits down the throats of the average American -- and keep their kids happy at the same time. Back in 1987, as the Raisins hit the scene, Hardees offered four different figures to customers with an extra buck in their pockets -- Tiny Goodbite (the singer), Justin X. Grape (blue shoed dancer), Ben Indasun (orange shoed dancer), and Saxophone Player (the...uh....saxophone player). My family ate at Hardees every Sunday before church so I took full advantage of this prime opportunity to build my collection of some of the most recognizable mascots of the late 80's. While the names of these figures sound more like the names of Garbage Pail Kids than California Raisins, I wound up with all four of the original set. Obviously a hit, why stop there? A year later in 1988, Hardee's upped the ante and brought out a six week offering of new characters -- Waves Weaver (the surfer), Rollin' Rollo (the roller skater), F.F. Strings (the guitar player), Trumpy TruNote (the trumpet player), Captain Toonz (the finger-pointing radio-listener), and S.B. Stuntz (the skateboarder). Somehow the popularity of these characters was still hanging on and my family was still hitting the local Hardee's every Sunday morning...so all six were mine. After a third round of plush Raisins in 1989 which I completely ignored, Hardee's tried again in 1991 with four new figures. Seriously. Hardee's felt like the California Raisins were popular enough to invest four years in them. I bought two of the four new figures -- Benny (the bowler) and Buster (the skater). Into my high school years by this point, I justified these purchases by only getting two of the four; but looking back, I must have been some sort of subconscious sexist as the two I didn't buy were the female characters -- Anita Break and Alotta Stile. Fast forward almost 20 years and the set is complete. Thanks to a local flea market, I was recently able to complete my set of 1991 California Raisins with the addition of Anita and Alotta. 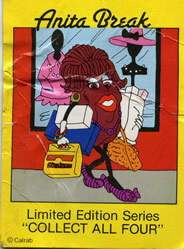 Anita Break came in her original packaging but it looked as though it'd been through the wringer a few times. Opening the package, the trading card and parental notice were stuck together. While not worth saving, I took some quick scans before this two items hit the trash along with the dingy plastic bag. 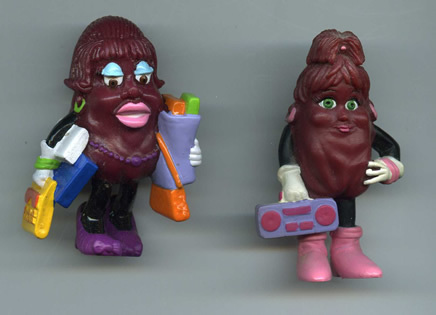 The California Raisins were definite icons of the late 1980's -- maybe even the early 1990's. In addition to all of these figures from Hardee's, I had a California Raisins t-shirt and lost my mind any time a Raisins commercial came on TV. Believe it or not, Hardee's came out with yet another set of four figures in 2000. I'm not sure how this promotion went as I was well into my college years by then, but I would wager that after thirteen years since the original set, these didn't do much for cinnamon raisin biscuit sales.